Manage your colonists. 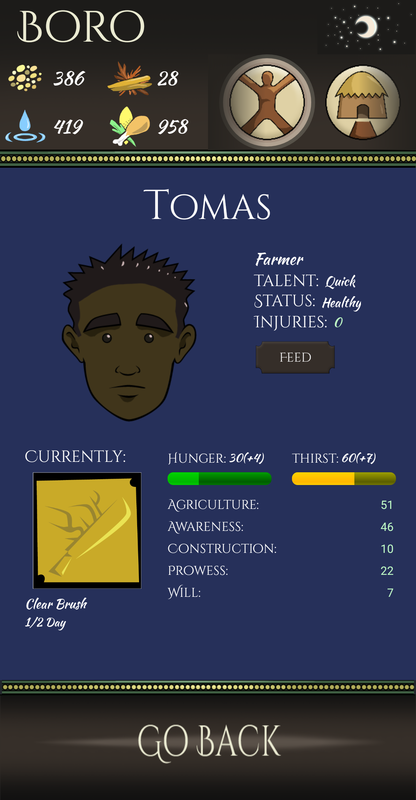 Assign tasks, provide food and water, and level up stats. Now, you must lead a group of survivors in a mysterious new land. Will your careful management build a thriving community with hope for the future? Or will it all unravel with the receding tide? Frontier: Isle of the Seven Gods is the debut game from Elder Aeons. It requires careful management of four resources (food, water, debris, and seeds) in order to build a thriving colony under challenging circumstances. The game is turn-based, with each turn being a day or night respectively. Use the scrolling icon menu near the top right of the screen to view the different components of your colony, including your colonists, structures, inventory, livestock, and available traders. During a turn, you can assign your colonists tasks by tapping on their faces, then tapping the golden task icon under "Currently." When you end your turn by tapping the "Advance Time" button, tasks will yield a variety of outcomes based on the colonist's skillset. You can also acquire special items, trade, fend off bandits, raise livestock, and more. Managing your colony to sustainability is the first challenge, from there your path is up to you. Note: The Game will function on most tablets, but is optimized for phones. Farming ability, especially important for planting, harvesting, and fishing. Keen senses, especially important for foraging and searching for survivors. Has numerous secondary benefits. Engineering chops, especially good for salvaging and construction. Instincts and agility, especially important for hunting, collecting water, or fighting off bandits. Affects hunger, thirst, and how quickly injuries are healed. These stats affect performance on various tasks. 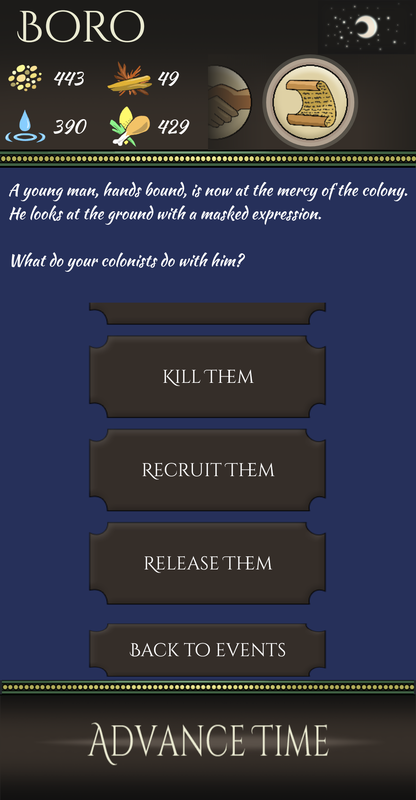 When assigning tasks, try to play to the strengths of the particular colonist. Colonists with high Prowess and Awareness will be better at hunting, for instance, but will not be very good at planting fields. Performing certain tasks may also result in stat increases. Upon performing a task, a colonist will always sleep for the following turn, unless an item like Coffee Grounds is used to awaken them. 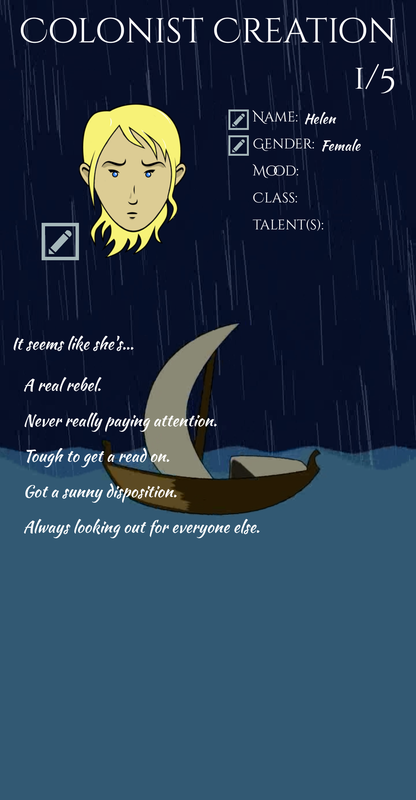 Colonists also have individual classes and talents, which affect their own stats and, in the case of Artists, the stats of the entire colony. Their individual personality will also affect the tone of their log entries. You should periodically feed your colonists with food or water to keep them productive and happy. If any colonist's hunger or thirst reaches 70, they will become famished and take serious statistical penalties. If those numbers reach 100, they will perish. This will prompt a decision about what to do with their body. Your choice will affect how the colony copes with the loss. Certain items, like cans of soup or goat's milk, can also be used to reduce hunger and thirst. Certain tasks and events can also result in injuries. Every injury a colonist sustains will increase the duration of any attempted task by 1 turn. If at any point a colonist sustains three or more total injuries, they will perish. Injuries heal naturally over time, or can be treated instantly with a poultice. Building up your colony consumes resources, but produces many benefits. You can learn about what structures you can build by viewing your schematics. Obtaining new items will automatically unlock new schematics. To build structures, you need specific materials and enough usable land. To open up more land, assign a colonist to clear brush. When the game begins, you will have two Shelters to house your colonists, a Garden Plot that provides two fields for planting, and two Rain Catchers that provide some water. You will need to add more structures quickly in order to sustain your colony. Consider building a Fire Pit, which increases the Will of the entire colony at the expense of one debris per turn, as quickly as possible. Some structures, like the Garden Plot, provide your colony with fields. Fields can be planted by assigning a colonist to plant. If they are successful (the odds of which improve with higher Agriculture stats), the field will then grow. Once it is grown, a colonist can be assigned to harvest it for a large boost of food and seeds. The quality of the harvest is also determined by the colonist's Agriculture skill. You can acquire useful consumables for your inventory through trade, tasks like Salvaging or Foraging, or certain events. Poultices can be used to heal injuries immediately, while items like Coffee Grounds can wake up sleeping colonists so they can continue to be productive. You can also use buckets to collect and purify water if you have a Fire Pit. There is a slew of additional items that are used to build specific structures. Keep a careful eye on your inventory and make sure to utilize what you have to the fullest. A skilled survivor who thrives when no one’s around to slow her down. Freya knows her way around the wilderness blindfolded and isn't afraid to crack a bandit skull or three. Even the best lone wolf needs a hand sometimes, and she's often willing to trade what she finds in the forest for goods and a little shelter. A tinker of sorts, constantly rummaging through the ruins of the Isle to leverage what he can in these dark days. Occasionally, he puts together something that works and is more than willing to trade. 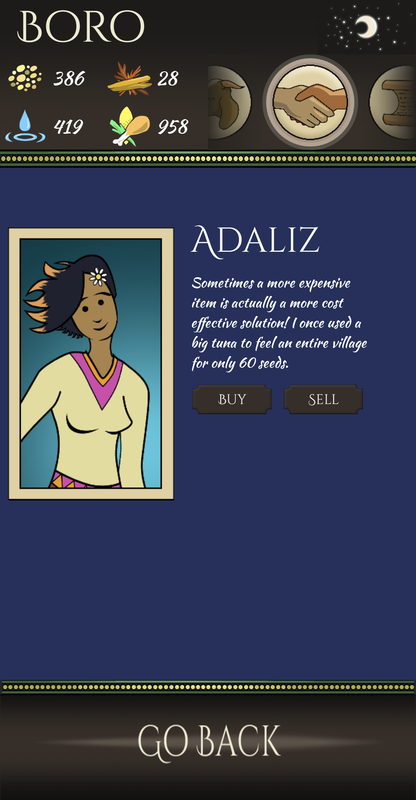 Adaliz knows a thing or two about living by the sea, she grew up on the Isle and is a servant of the Water Lady. She has a keen eye for detail and can conjure up all sorts of things from the water. Not the worst traveler to bump into, all things considered. There are two types of livestock you can rear and keep: Fowl and Goats. They are acquired when a skilled Hunter with a strong awareness is fortunate enough to trap one in the wild. If you've built a Coop (Fowl) or Pen (Goats), the domestication option will become available. Once you have a few animals, colonists with high agriculture can rear additional animals. The animals will need to consume seeds and water regularly to survive. You can have a farmer slaughter the animals for food at any point, but keeping them alive will yield benefits like eggs and milk.